If you’re looking for something new to do with your favourite biscuit rather than just dunking it your tea, this might be the answer. The staff at Yorkshire Tea put together an epic domino run using 5,000 biscuits – including pink wafers, Bourbons, custard creams, shortbread and Jammy Dodgers – and the results are amazing. Constructed to celebrate Yorkshire Tea’s Biscuit Brew, the stunt was, according to the company, the world’s first domino run made almost entirely from biscuits. It also featured cans, cups, teapots and more than 500 boxes of Yorkshire Tea in a course that wound through the company’s office and tasting rooms in Harrogate. It took a team of 34 people, including Yorkshire Tea staff and domino expert Mathias Ritter, 10 hours to put together and measured 120 metres in length. 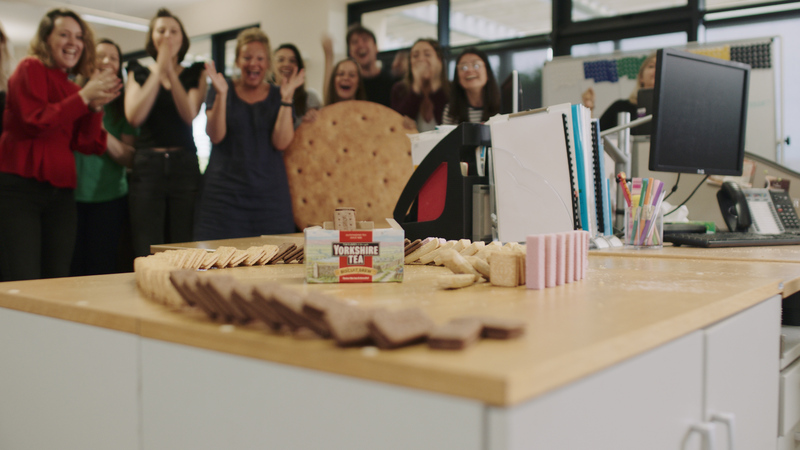 Yorkshire Tea’s innovation manager Kate Halloran, who invented Biscuit Brew, said: “I was inspired by Britain’s favourite biscuits to create Biscuit Brew, so we thought what better way to celebrate it than to bring our team together and attempt the world’s first domino run of biscuits? Let’s just hope there were plenty of cups of tea on hand to dunk the biscuits in afterwards. Is blinding someone a worse crime than taking away their life? New Year's resolutions - sticking to yours?